Our favorite little dolphin is back and has even more tricks up his sleeve! Dive, swim, and jump to capture the hearts of the audience and earn gold coins to purchase new, better-than-ever outfits! Can you perform the stunts to perfection to receive a full audience and earn the best outfits money can buy? Try it today! 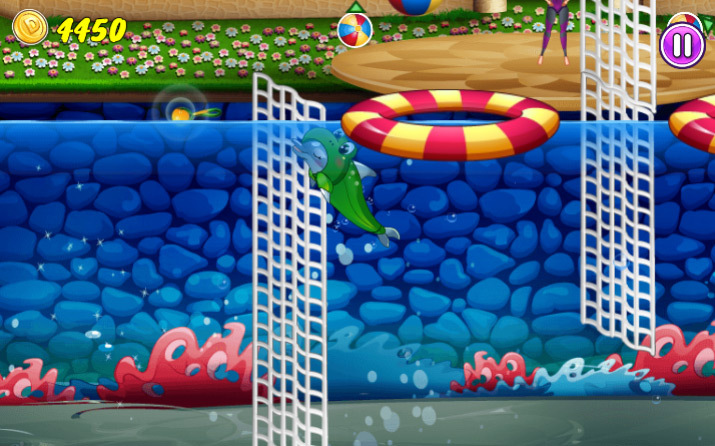 The object of the game is simple – use your arrow keys to swim, jump, and dive left, right, up and down. Perform the tricks that your trainer has taught you to reel in a larger audience. Capture the audience’s hearts and put a big smile on their face to earn lots of gold coins! If you do a great job, your trainer will toss you some tasty golden fish that will help you rack up even more gold coins! 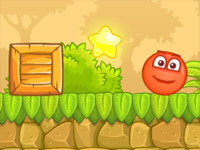 Usually, online games don’t have many levels, since they supposed to be simple and easy to play. 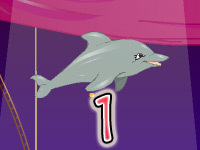 My dolphin show is different and features 18 amazing levels to complete much more than Red Ball 7 or other popular games. Levels 17 and 18 are significantly harder to unlock though, because in order to unlock level 17, you need to have a minimum of two stars for every level. To unlock level 18, all previous levels need to have all three stars! Each level gets progressively more difficult than the last, with more and more stunts to perform correctly. For instance, to complete level one, you must complete a total of 4 stunt. The first stunt is to simply jump out of the water and nose-tap two beachballs. 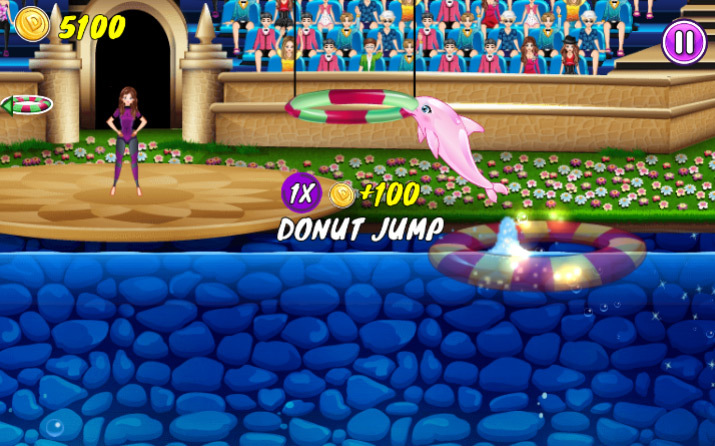 The second stunt is to jump out of the water, through three suspended hoops, then dive back into the water through the floating donut hoop. The third stunt is to hurtle over two floating beams while nose-tapping two suspended beachballs. And finally, the fourth stunt is to jump through the floating donut while nose-tapping three suspended beachballs. 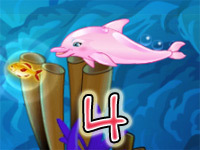 In level two, though, the first stunt is remarkably easy – simply swim through the three rings under the water’s surface. 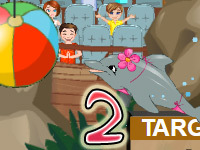 The second trick is a bit harder – swim vertically through three rings under the water, then nose-tap the suspened beachball and land in the circular ring near the water’s edge to splash the audience. The third trick is to hurtle over a floating bar then dive through a suspended ring back into the water. The next trick is to swim up through three underwater rings, over a net and nose-tap a suspended beachball then dive down through three underwater rings on the opposite side. For the last trick, you need to jump through a total of five different rings – two floating on top of the water and three suspended in the air. 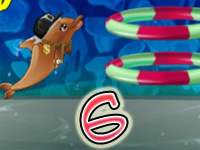 As you complete each level, you’ll be able to unlock a wide variety of outfits that your cute little dolphin can wear during his next performance. Some of these outfits are pretty inexpensive, however some of them can be quite pricey so as you play you may want to consider saving your coins for the really awesome, super expensive outfits that are sure to wow your audience! 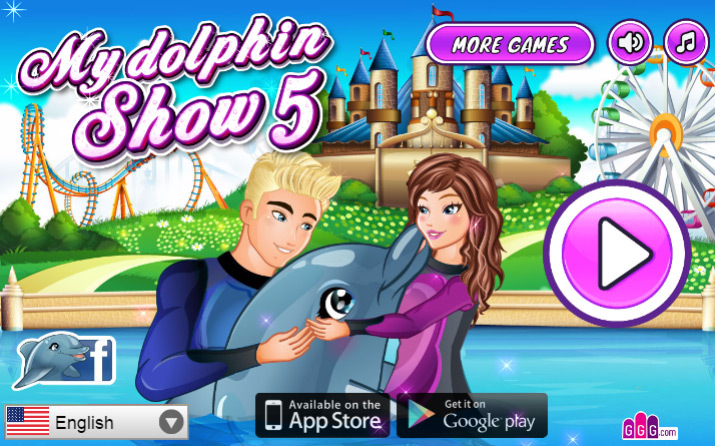 ©2017 My Dolphin Show 5. All rights reserved.